Spoiler Alert: Ad blocking is a serious problem, and new research is painting a clearer picture of just how bad it really is. The 2016 Reuters Digital News report, which surveyed more than 50,000 online news consumers across 26 countries, shows ad blocking is most common among those who get news online and under 35s, the research showed. Smartphone users arenâ€™t huge on ad blocking yet, with only 8 percent admitting they use it, however a third of interviewees said they plan to use an ad blocker in the next year. The statistics vary hugely across the globe, however. 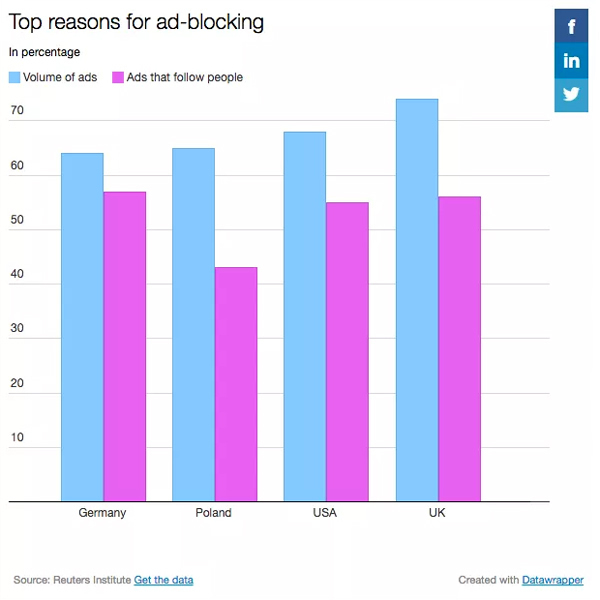 For example, Poland has the highest percentage of ad blocking, at 38 percent. 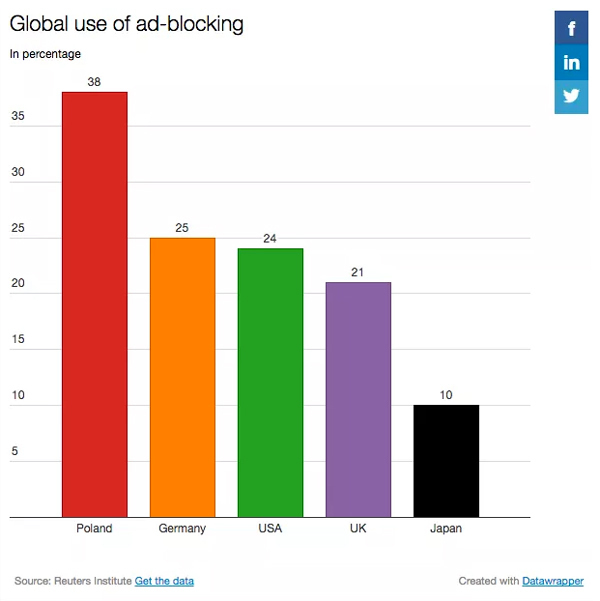 In Japan, only 10 percent say they block ads. Digiday has zoned in on five countries â€” the U.S., U.K., Japan, Poland and Germany â€” to take a closer look at who uses ad blocking, and why. Polandâ€™s high use of ad blocking could be put down to news websites being overloaded with ads, combined with heavy usage of illegal video streaming services which have â€œextremely intrusiveâ€� advertising, the research said. For the U.K., where ad blocking is at 21 percent, the research said newspapers have been hit the hardest because of ad blockers. Most people said they use ad blockers on their laptop or desktop, which is some relief for publishers as mobile overtook desktop computers as peopleâ€™s preferred device to access the internet last year, and that trend is forecast to jump by 28 percent this year, according to Zenithâ€™s Media. 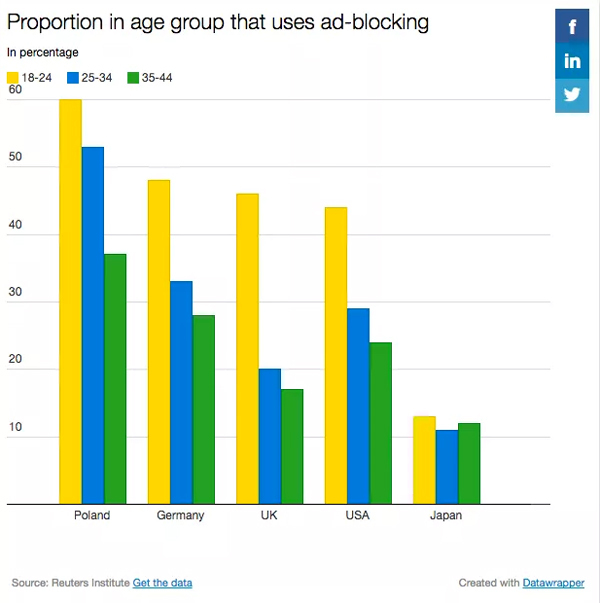 The Reuters data sends a clear message to publishers: those between the age of 18 and 24 are the highest users of ad blockers. But the older people get, the less interested they are in ad blocking. But within all this, the research did offer a little light in the end of the tunnel: across all countries it found younger groups are more prepared to accept advertising for free news, despite younger people being the some of the biggest users of ad blockers. People decide to block ads for all kinds of reasons it seems. The research showed there wasnâ€™t just one reason, however the volume of ads, and ads that followed people, were by far the two biggest reasons across all countries. The growing number of people choosing to use ad blockers is one of the major challenges publishers face. If publishers do little more than they already doing to combat it, one researcher estimates they will lose $35 billion by 2020. 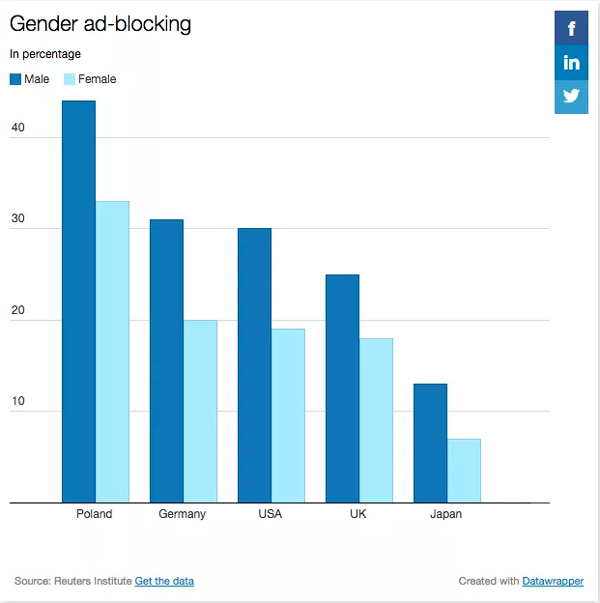 Publishers also face a gender problem when it comes to ad blocking. Men are far more likely to block ads, although the research did show women are much more likely to use social media to find news, rather that going to a website or app. While ad blocking is one of the major problems faced by publishers, the research said organizations are evolving and responding. It noted a number of publishers are turning to sponsored content, which often use the same formats, fonts, and templates as other editorial content â€” and is harder to block. Copyright 2016 Digiday. All rights reserved. From http://www.digiday.com. By Jemma Brackebush.